The Earth science community is well along in preparing to brief transition teams on b oth the Obama and McCain campaigns about key issues facing the country, including energy, water, minerals, natural hazards, climate change, and sustainability, in which the geosciences play a key role. The American Geological Institute's Government Affairs Program has engaged 40+ representatives from among its member societies in recent months to identify the Earth science related issues facing whoever will be President next year. The The AGI Executive Council has similarly been working on the plan, which is expected to be taken to the transition teams in both campaigns in August. Linda Rowan is coordinating the AGI effort. 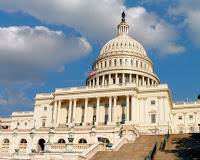 The Geological Society of America, as a member society of AGI, is participat ing in this initiative, but they are also developing their own program through the newly established Washington DC office, headed by Craig Schiffries. The American Association of Petroleum Geologists also has a DC office, with David Curtiss recently taking over from the retiring Don Juckett. AAPG is wo rking with AGI but also expects to develop a specialized set of materials on energy issues, built around the AGI package. This is the assessment of Scott Tinker, State Geologist of Texas, and the new president of the American Association of Petroleum Geologists (AAPG). Scott described the future of energy and the role of state geological surveys in a presentation to the AASG annual meeting today. 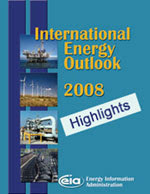 He noted that 87% of energy produced in the world today is from fossil fuel. A number I had not seen previously is that oil as a percentage of world energy supply, peaked in 1979 at about 47%. It has steadily decreased since then to about 36% plus or minus, today, and is projected to continue to decline. What that means is coal and natural gas have increasingly made up the difference. And with coal under pressure for its CO2 contributions, the demands on natural gas and nuclear will be huge. We import 20% of our national needs in natural gas today, but it appears that will have to increase dramatically in conjunction with nuclear power doubling and renewables quadrupling. Each of these is daunting on its own. Cumulatively, we face serious challenges as a nation in a rapidly developing world. Ian Jackson, Operations Director of the British Geological Survey, told the AASG annual meeting yesterday that BGS dedicates 1/3 of their budget to managing and delivering information. It’s the direction most of us are moving but in a piecemeal fashion. Britain recognizes its future lies in the knowledge environment. That’s the same direction Arizona is heading. Governor Napolitano’s Innovation Arizona initiative, the creation of Science Foundation Arizona, and other investments in science and technology are bold steps on the national scene. AZGS is driving hard into this field with our leading role in building the national geoscience data network (GIN) in partnership with the global consortium, OneGeology, being led by the BGS. The Association of American State Geologists (AASG) is 100 years old. The anniversary of this organization is cause to recall the impacts state geologists have had in the geosciences in the past century and to discuss our roles in the next. Two dozen state geologists met in Washington DC in May 1908 with the Director of the USGS, one day before a Conference on Conservation called by President Theodore Roosevelt with 44 state governors. Two state geologists, Richard Hice, of PA, & Israel White, of WV, were speakers at the conference and four others were there as part of their governor’s teams. The first resolution passed by the AASG that day was to call for a national program to map the topography of the nation. It was hand carried to the White House so as to be addressed by the Conservation Conference. I’m in Shepherdstown, West Virginia at the Centennial Annual Meeting of AASG. Over the next few days, I hope to be blogging about the roles of geological surveys in science, society, and policy. 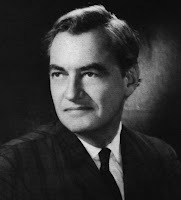 John Watson Foster Dulles [family photo], son of the Secretary of State during the Eisenhower administration, and a prominent figure in Arizona mining, died last week at 95. His great-grandfather and a great uncle were also secretaries of state, while his uncle headed the CIA. Bored with New York banking in the late 1930s, he took a position with C. Tennant & Sons, Co. in the Duquesne mine of Patagonia, Arizona near Nogales, where he mucked the roads to the mine, and then advanced to underground operations. He got a second bachelors degree from the UA School of Mines and Metallurgy in 1943, and an advanced degree in metallurgical engineering before going to mining jobs in Mexico and Brazil. In 1962 he became a professor of Latin American studies at the Univ. of Texas and for 25 years also taught at UA. According to the company’s press release, discovery hole A-20-01, the first hole to test the A-20 anomaly, intercepted a thickness of 34.5 feet averaging 0.37% U3O8 at a depth of 1,442 feet, including a high-grade zone of 6.5 feet averaging 0.63% U3O8 at a depth of 1,443 feet. The hole also intercepted a deeper zone of 13.0 feet averaging 0.46% at a depth of 1,567 feet that includes a higher grade interval of 10.0 feet averaging 0.58% U3O8. The A-20 target is the second of more than 200 moderate-to high-priority VTEM geophysical anomalies defined on Quaterra's 85 square mile property. Unlike the A-1 structure, A-20 is not a hidden pipe. However, because of its subtle surface expression it remained undetected until Quaterra's VTEM survey. Additional drilling at A-20 will be deferred until later this year. The Company is accelerating testing of additional high-priority VTEM anomalies and is currently drilling a third VTEM target. "It’s about three drilling rigs out in west Texas racing down to 10000’. Cameras on the rig floor follow the roughnecks, the driller, the company men and owner as the wells drill and get stuck, the machinery breaks down and the crews screw up or get time off in town and booze it up. It’s amazing any thing gets drilled when you see the chaos on the drill floor." I took a quick look at the online clips to see that it looks pretty realistic. All of us who have worked on rigs have stories like these to tell, ranging from funny to tragic. 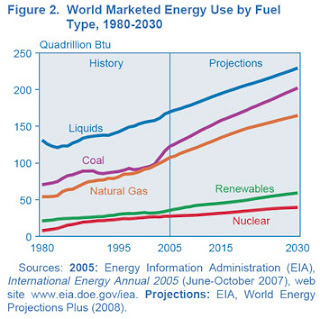 from 2004 to 2030 according to a new analysis by the US Energy Information Agency. The biggest increase, 95%, will be in the lesser developed nations, compared with an increase of 24% in the industrialized countries. Note that the forecast is for growth in use of fossil fuels to outstrip that for renewables and nuclear. The Committee made an emergency declaration under the Federal Land Policy and Management Act, which has been used only four other times in history to halt energy development. The last time was 1983, but reportedly a Justice Dept. opinion that year found similar resolutions to be unconstitutional. The committee's vote is all that is necessary to temporarily block mining claims. Rep. Raul Grijalva called it a temporary measure until action can be taken to permanently halt exploration and mining. The award will be presented at the GSA meeting in Houston in October. Secret message in the Arizona quarter? 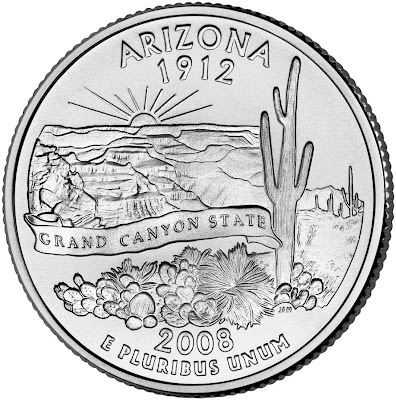 The blog of the Arizona House of Representatives says the letters below the saguaro on the new Arizona quarter are "JIM" and were personally selected by Gov. Napolitano as a paean to House Speaker Jim Weiers, who is often at political odds with her. Others who look closely, instead see the letters "JFM" which coincide with the initials of Joseph Menna, the mint sculptor who crafted the coin. But why let facts get in the way of a really cool conspiracy theory? Interestingly, when I followed the lead on this item, I found a roll of quarters for sale on eBay with a variation on the coin where an extra prickly pear pod? leaf? (hey, just what do you call those flapjack shaped pieces?) covers up the initials. So, is this also part of the conspiracy? Do the initials being obliterated by cactus send another hidden political message? Do we see a movie plot here, with Tom Hanks in the lead role? Stay tuned. The mining and steel manufacturing communities are reeling from the Rio Tinto announcement this week that its iron ore fines prices were raised by 79.9% over last year, and its lump prices were up 96.5%, for annual contract prices, for an overall 85% increase. The deal is with Chinese steel maker Baosteel. Vale earlier this year saw settlement increases of 65% and 71% respectively. The folks at mineweb.com called it "akin to oil prices instantaneously moving up to $270 a barrel, or gold bullion jumping in a jiffy to around $1,800 an ounce." 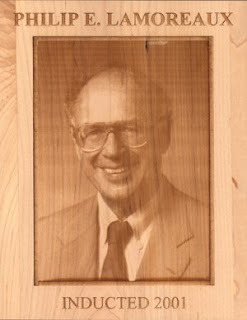 In memoriam - Philip LaMoreaux, Sr.
Phil LaMoreaux died last night. He's not from Arizona, or even worked here much as far as I know. But he was one of the more influential leaders in the earth sciences in recent decades. Phil was always gracious and upbeat. He drew forth the best from everyone he worked with. There will be memorials with more details on his contributions, but for those who did not know him, let me list a few accomplishments. Economic forecasts are for natural gas to rise 20-25% by next winter, in part due to competing demands for its use to generate electricity. Power utilities are reluctant to build new coal-fired plants because of uncertainties over controls or costs of greenhouse gases, especially carbon dioxide. Natural gas plants are cheaper and quicker to build than coal plants. This is a trend across the country. Financial analysts in a story on Bloomberg.com predict uranium prices will jump 58% from $57 to $90 per pound, as a result of large numbers of new nuclear power plants in India, China, and likely elsewhere. The construction program is compared to the one prompted by the oil crisis of the 1970s. 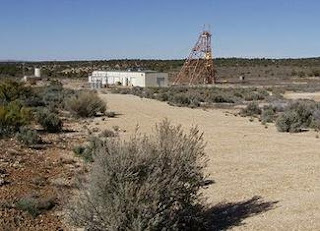 Demand for uranium is expected to grow as fast as the demand for oil. The world needs to build 32 new nuclear plants each year as part of measures to cut emissions in half by 2050, the Paris- based International Energy Agency says. 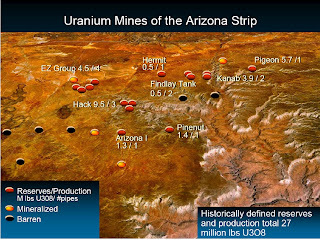 Uranium prices dropped 57% in the past year but mining companies, including some in Arizona, continued exploration programs, in the recognition that long term demands would outpace production. In 2006, 39,429 metric tons of uranium were mined, while demand last year hit 66,500 tons, and is expected to reach 102,000 tons by 2020. Uranium exports from Russian inventories and decommissioned warheads to the U.S. will cease in 2013. Sen. John McCain is reported to have called for almost doubling the number of nuclear reactors to lessen the nation's dependence on foreign oil. Sen. Barack Obama is describe as also backing nuclear power. Phoenix-based Southern Copper Corp. announced a three-for-one common-stock effective July 10, pushing the company’s share price up $3.61, or 3.43 cent, Friday to $108.80. The company mines copper, molybdenum, zinc, silver, lead, and gold in Mexico and Peru. Mexican conglomerate Grupo Mexico owns 75.1% of Southern Copper. Brazilian mining group Companhia Vale do Rio Doce said that it was not in talks to buy another company. In recent weeks, news reports identified potential takeover candidates, including Phoenix-based Freeport McMoRan. Vale previously announced plans to raise up to $15 billion by selling shares, which fueled speculation they were lining up cash for bidding on another mining company. The U.S. Army Corps of Engineers has ruled the Santa Cruz is “navigable,” meaning all tributaries and drainages to tributaries may be regulated under the Clean Water Act. Opponents of the Rosemont copper mine argue that Davidson Canyon is included as a feeder stream to tributary of a navigable stream, making it more difficult for Rosemont to put mine waste there. 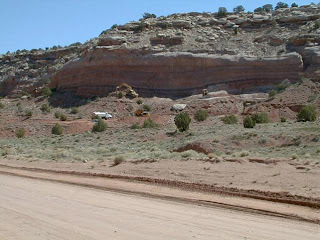 A group of five federal agencies are launching a five year assessment and cleanup program of uranium contamination on the Navajo Nation. 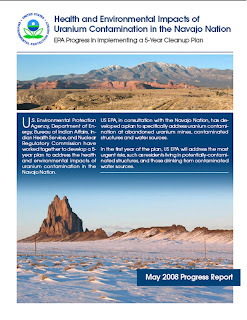 "EPA, along with the Bureau of Indian Affairs (BIA), the Nuclear Regulatory Commission (NRC), the Department of Energy (DOE), and the Indian Health Service (IHS) developed a coordinated Five-Year Plan (PDF) address uranium contamination in consultation with Navajo Nation EPA. "During the next five years EPA will focus on the problems posed by abandoned uranium mines, completing a tiered assessment of over 500 mines and taking actions to address the highest priority mines. As mines that pose risks are discovered, EPA may use Superfund authorities, including the National Priorities List, enforcement against responsible parties, or emergency response to require cleanup." Potash prices jumped from $504 per ton to $525 last in April, and could hit $800 by the end of the year, according to Scotiabank economist Patricia Mohr. She noted that even at $1,000, potash would only account for 3.6% of farmers revenues on average. 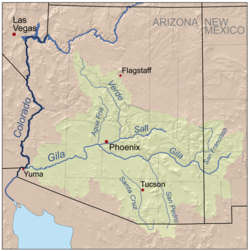 Arizona has large resources in the Holbrook basin that have not been considered economically attractive until recently. Reports are that 14 square miles of state leases have recently been acquired in the area for potash exploration. Americans got a textbook example of sublimation last week with the release of 'before and after' photos from the Phoenix Mars Lander. Marble-size clumps of bright material vanished from inside a trench where they were photographed four days earlier, convincing project scientists that the material was frozen water that vaporized after digging exposed it. The photos at right [credit: NASA/JPL-Caltech/University of Arizona/Texas A&M University] show the clumps in the lower left shadow area of the left photo but gone in the right photo, taken four days later. Project leader Peter Smith noted that salts will not dissolve or dissipate like this, leaving only ice as the logical conclusion. That presumes however, that the clumps were not carried off by Martian critters. It looks like Louisiana will be the next great battlefield over teaching science in the public schools. A bill passed by the Legislature is expected to be signed by Gover nor Bobby Jindal, that is the latest attempt by the Discovery Institute to introduce their Intelligent Design creationism into the curriculum. The bill specifically identifies evolution, stem cell research, and climate change as questionable science that must be challenged, but opens all scientific knowledge to challenge for any reason, regardless of whether the criticisms have any scientific merit. This may be the first test of the pure ID political strategy. Previous efforts in Kansas and Pennsylvania failed because local officials took heavy handed actions to impose their personal religious beliefs into the schools, that backfired. In this latest version, Intelligent Design creationism is never even mentioned in the legislation. A coalition of science organizations organized by Scientists and Engineers for America released a set of questions today that should be asked of every Congressional candidate in the country. Of the 7 questions, 6 are directly earth science related or relevant. Only the health care question is not something that falls into our purview. A set of questions intended for the presidential candidates will be forthcoming and I'll post about them as well. Innovation. 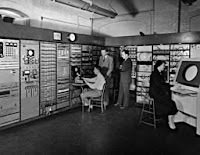 Science and technology have been responsible for half of the growth of the American economy since World War II. But several recent reports question America’s continued leadership in these vital areas. What policies would you support to ensure that America remains the world leader in innovation? Climate Change. The Earth’s climate is changing and there is concern about the potentially adverse effects of these changes on life on the planet. What is your position on the following measures that have been proposed to address global climate change—a cap-and-trade system, a carbon tax, increased fuel-economy standards, and research? Are there other policies you would support? Energy. Many scientists and policymakers say energy security and sustainability are major problems facing the United States this century. What policies would you support to meet the demand for energy while ensuring an economically and environmentally sustainable future? Education. A comparison of 15-year-olds in 30 wealthy nations found that average science scores among U.S. students ranked 17th, while average U.S. math scores ranked 24th. What role do you think the federal government should play in preparing K-12 students for the science and technology driven 21st Century? Water. 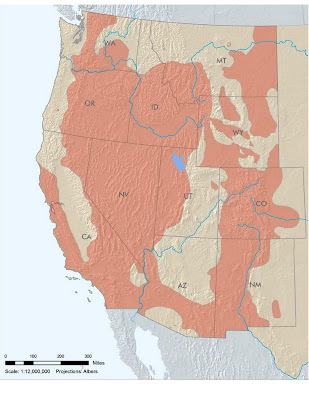 Thirty-nine states expect some level of water shortage over the next decade, and scientific studies suggest that a majority of our water resources are at risk. What policies would you support to meet demand for water resources? Research. For many years, Congress has recognized the importance of science and engineering research to realizing our national goals. Given that the next Congress will likely face spending constraints, what priority would you give to investment in basic research in upcoming budgets? Health. Americans are increasingly concerned with the cost, quality, and availability of health care. How do you see science, research, and technology contributing to improved health and quality of life? The current issue of Industrial Minerals magazine has a short article on Zeox Corp.'s new zeolite product that can be used as a high-strength, lightweight drilling cement. 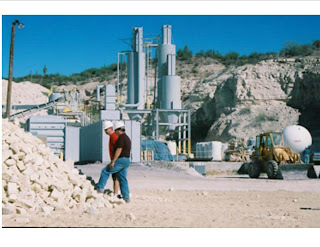 Zeox operates the White Cliffs processing facility [right: credit Zeox Corp.] about 60 miles northeast of Tucson, which produces up to 40,000 tons per year of diatomite and zeolite products. The article says the new product can greatly reduce the density of downhole drilling cements. Other uses for the zeolites include applications in water-treatment and removal of mercury from coal-fired stack gases. Increases in areas of the Southwest U.S. affected by drought are likely, according to a report released today by the U.S. Climate Change Science Program. 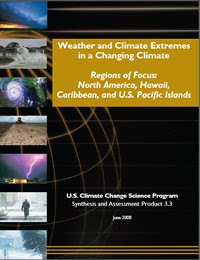 This is billed as "a scientific assessment that provides the first comprehensive analysis of observed and projected changes in weather and climate extremes in North America and U.S. territories." The report is the first time there has been a specific assessment made across North America. "Among the major findings reported in this assessment are that droughts, heavy downpours, excessive heat, and intense hurricanes are likely to become more commonplace as humans continue to increase the atmospheric concentrations of heat-trapping greenhouse gases." Abnormally hot days and nights, along with heat waves, are very likely to become more common. Cold nights are very likely to become less common. Precipitation, on average, is likely to be less frequent but more intense. Droughts are likely to become more frequent and severe in some regions. Lawrence Krauss [right], a theoretical physicist and cosmologist who wrote the best selling book, "The Physics of Star Trek," will join Arizona State University in August to assume a leadership role in an emerging research and educational initiative on "origins." I know him from his leadership in fighting the anti-science Intelligent Design political movement. According to the ASU press release, Krauss will join ASU's faculty as professor in the School of Earth and Space Exploration in the College of Liberal Arts and Sciences. 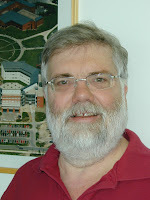 He will come to ASU after 15 years at Case Western Reserve University in Cleveland, 12 as chair of the physics department. 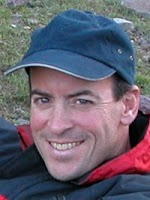 Previously, Krauss was a member of the physics and astronomy departments at Yale University. Scientific American has described Krauss as a public intellectual. In addition to writing the best-seller, "The Physics of Star Trek," which has been translated into 13 languages, Krauss has written six other books, including "Fear of Physics," "The Fifth Essence," "Quintessence," "Beyond Star Trek", "Hiding in the Mirror," and the science epic "Atom: An Odyssey from the Big Bang to Life on Earth ... and Beyond." Krauss also has appeared on numerous radio and television programs in the U.S., Canada and Europe, including three BBC documentaries, National Public Radio's "Science Friday," Nova, the Discovery Channel, CBC's "Quirks and Quarks," National Geographic and the History Channel. Krauss has helped lead a national effort to defend and promote science, from Washington to the classroom, beginning in 2002 with his own successful efforts in Ohio to keep evolution in that state's science curriculum. Why are so many foreign companies investing in Arizona mines? Why are so many foreign companies investing in U.S. and particularly Arizona mining projects? Today we hear that Sumitomo Corp. of America has loaned Augusta Resources Corp. $40 million in exchange for the right to negotiate a minority ownership interest in the Rosemont project [right: credit, Rosemont Copper]. Augusta itself is a Canadian company, with financial support from another Canadian company, Silver Wheaton. Sumitomo's web site says the company "serves several American mining companies in exporting their commodities to Japan and other countries." Sterlite Industries of India is bidding to take over Asarco from Grupo Mexico. The giant Resolution Copper project is a joint venture between Australian BHP Billiton and UK-based Rio Tinto. Sumitomo already has a 15% stake in Arizona’s huge Morenci mine, run by Freeport McMoRan. Their $40 million investment in the Rosemont mine will be used to buy equipment. These are just a few high profile examples. What it indicates is that other nations are taking strategic actions to ensure long-term supplies of mineral resources in a world of increasing demand and competition. It also means that Arizona mineral deposits are world-class. The company plans to acquire new properties, and integrate the extraction of precious and base metals. They believe they will be able to produce metals and minerals below standard industry costs. Grupo Mexico’s $4.1 billion counter-offer for Asarco would use $1 billion of Asarco’s own assets with the rest coming from the Mexican firm. Reports are that Vedanta Resources’ subsidiary, Sterlite Industries, would consider legal action if the bankruptcy court accepts the Grupo Mexico proposal. Sterlite had apparently won the bid competition among Grupo Mexico, Swiss industrial conglomerate Glencore International AG, and a consortium of Harbinger Capital Partners and Citigroup Global Markets. "The smartest night of the year"
I wrote this while flying back from Germany, where I fortuitously happened to finish a conference the day before the “Long Night of Science” (Lange Nacht der Wissen shaften, also known as the “Smartest Night of the Year” - Die Klugste Nacht des Jahr). One directory of activities is 240 pages long. In small print. There were posters and banners up everywhere in the cities. Brochures and flyers fill kiosks and informatio n racks next to others on local tourist destinations. Banners flew from every university. My conference was on the famous Telegraph Hill area in Potsdam that has been a center of science and research since the earliest days of the nation. Germany’s equivalent of a national laboratory for geology (GFZ) is based there, along with the Einstein relativity lab and other facilities. We got a sneak preview of some of the events and activities planned which they said drew thousands every year. I happened to be in the Friedrichstrasse train station (bahnhof) at just before 5 pm on Saturday and discovered a large information booth [above - just before the crowds arrived] for the festival, staffed with four people who were scrambling to answer questions, restock the bins with brochures, hand out balloons and sell tickets. Yes, the science night tickets cost 10 euros (about $16) but it does include bus and subway fares as well. While I watched, a constant stream of travelers queued up for information and tickets. What an invigorating environment – being in a nation’s capitol where the biggest thing on a cool summer evening is discovering and enjoying the process, successes, and benefits of science. The scientists at GFZ and their colleagues looked on the night for the public as a natural and rewarding part of their commitments as scientists. I don’t know if we could ever hope to engage the American public as well, but I have a vision now of what it might look like if we could. UA professor of planetary sciences and geosciences, Jay Melosh, will receive the 2008 Harry H. Hess Medal from AGU on December 17 at the society's fall meeting in San Francisco. The medal is awarded "for outstanding achievements in research in the constitution and evolution of Earth and its sister planets." Jay is internationally renown for his work on impact cratering and the origin of the moon. His book, "Impact Cratering, A Geologic Process," has been one of the definitive references in planetary sciences since it was published in 1989. Congratulations Jay, this is well deserved! 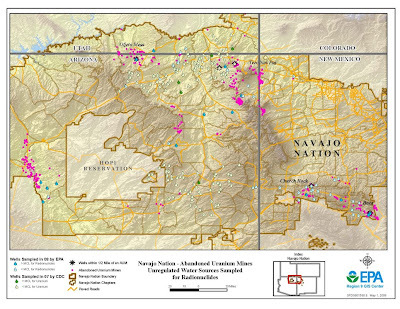 The Tonto National Forest will hold a public meeting and open house on plan of operations for the proposed Resolution Copper mine near Superior [right: credit Resolution Copper], on Wednesday, June 25. It runs from 4:30 - 8:30 pm in the Superior Jr/Sr High School at 100 Mary Drive. 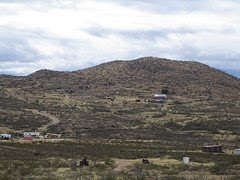 More information, including Resolution Copper's Proposed Pre-Feasibility Plan of Operation, is online at http://www.fs.fed.us/r3/tonto/home.shtml. Comments can be submitted via e-mail at comments-resolution-prefeasibility-proposal-tonto@fs.fed.us. Geothermal PEIS released for western U.S.
A public hearing will be held in Tucson on Wednesday, July 16 on the plan as one of 13 hearings around the West. The meeting will be 5:30-7:30 pm, at the Pima County Public Library, Dusenberry River Branch, 5605 East River Rd. BLM manages 142 million acres and USFS 106 million acres of lands where direct-use geothermal resources exist. Of that, BLM has 117 million acres and USGS 75 million acres that might be open to geothermal leasing under various restrictions. No leasing will be allowed in national parks, wild rivers, wilderness areas, or national recreation areas. 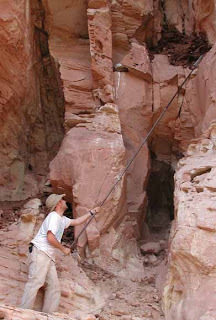 The Arizona State Board of Technical Registration (BTR) will hold a public hearing on July 22 to consider raising the triennial fees for registration as a geologist from $126 to $165. This fee increase would also apply to architects, engineers, landscape architects, and surveyors. Bloomberg news service reports that JP Morgan Chase believes that Brazilian-based Vale is “most likely” to bid for Freeport-McMoRan Copper & Gold Inc.
Vale, the biggest iron-ore producer, has been rumored to be looking at three large mining companies. Phoenix-based Freeport is the world's largest publicly traded copper mining company. Vale is planning a public stock offering to raise as much as US$15 billion, to possibly help fund acquisitions. New Zealand's Marlborough Express carries a story about UA geosciences professor emeritus Bill Bull [right: credit Univ. AZ] who splits his time between Tucson and Kaikoura, NZ. Bill is an expert on the famous Hope fault which is described as part of one of the world's most active fault zones, comparable to the rate of movement on the San Andreas fault. It threatens Wellington and other cities with major earthquakes. 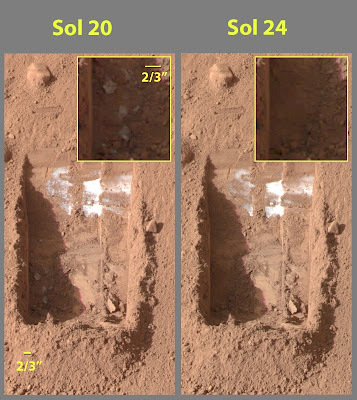 The news from the Phoenix Mars Lander is that it has successfully scooped up soil [right top; credit University of Arizona] and filled the oven for analysis. The oven is really the Thermal and Evolved-Gas Analyzer instrument, or TEGA [right bottom; credit, University of Arizona]. It has eight tiny ovens to "bake and sniff the soil to assess its volatile ingredients, such as water." Despite all the high-tech jargon and equipment, I have to admit that my first thoughts were of small children making mud pies and putting them into toy ovens. Vale has reportedly also investigated Anglo American Plc, and aluminum producer Alcoa Inc. Vale may be selling $30 billion of shares to finance the takeover. AZGS will receive nearly $750K [6-18-08 update - we requested $750K but NSF will only be able to provide about $650K total] from the National Science Foundation over the next 3 years to build the Geoscience Information Network (GIN) as the project manager on behalf of the nation's state geological surveys and the USGS. The project is funded under the NSF INTEROP initiative to build interoperable data networks in scientific communities. I'm writing this from the Geoinformatics 2008 conference in Potsdam, Germany hosted by the GeoForschungsZentrum, where I announced the award a few minutes ago in my talk to the group. Just before my talk, Ian Jackson of the British Geological Survey an d leader of the OneGeology consortium, announced that the Europe Commission will fund a complementary effort among 27 European national geological surveys and their partners (OneGeology-Europe), to build a continent-wide data network. The EC funding is 3.6 million euros. The OneGeology consortium now has 79 nations that have signed the protocols to create a digital global geologic map at 1:1 million scale as the first step in building global spatial data infrastructure. OneGeology is a partner on the AZGS project with NSF and AZGS/GIN is partnered with the OneGeology project. What this means is we will develop common standards and protocols across the nation, and now around the world, for seamlessly linking digital geoscience data. Will water be the new oil? Ice table under Mars' Phoenix Lander?